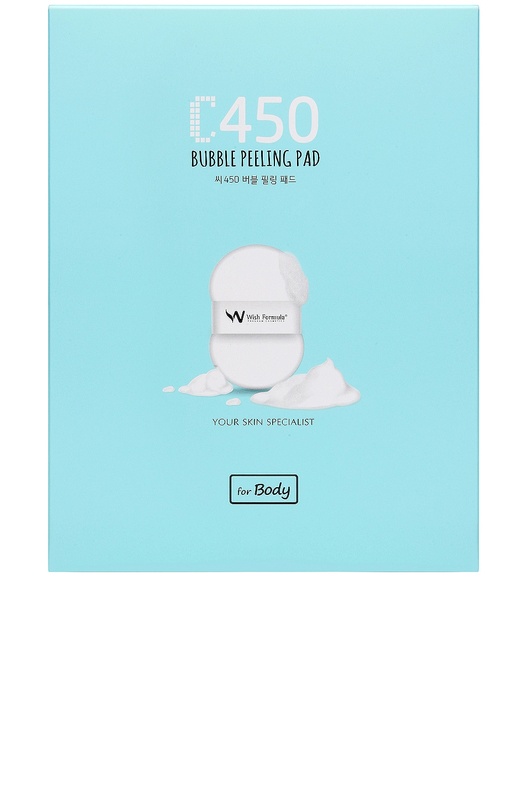 Wish Formula's C450 Bubble Peeling Pad for Body introduces an innovative approach to at-home peels. Infused with brightening Vitamin C, Hyaluronic Acid, and AHAs, these serum-soaked dual-sided puffs gently resurface rough, dry areas to reveal healthy skin. Water, Cocamidopropyl Betaine, Glycerin, Dipropylene Glycol, Disodium Cocoamphodiacetate, Lactic Acid, Glycolic Acid , Sodium Lauroyl Sarcosinate , 3-o-Ethyl Ascorbic Acid , Lactobacillus/Olive Leaf Ferment Extract , Saccharomyces/Peppermint Leaf Ferment Filtrate Lactobacillus/Clover Flower Ferment Extract, Sodium Hyaluronate, Polyglutamic Acid, Impatiens Balsamina Flower Extract , Rosa Multiflora Fruit Extract, Lepidium Meyenii Root Extract, Eriobotrya Japonica Leaf Extract, Pachyrrhizus Erosus Root Extract , Aureobasidium Pullulans Ferment, 1,2-Hexanediol, Butylene Glycol, Arginine, DMDM Hydantoin, Parfume.